Loretta Lynn invites you to celebrate the 2016 yuletide season with the release of her new album, White Christmas Blue, on Friday, October 7th on CD and vinyl. The album debuts “White Christmas Blue,” a future yuletide classic newly penned by Loretta Lynn and Grammy Award winner Shawn Camp (who’s written #1 country hits for Garth Brooks, Josh Turner and Brooks & Dunn, collaborated with Loretta since 2007, and provides acoustic guitar and backing vocals on White Christmas Blue). White Christmas Blue is the second volume of the Cash Cabin Recordings and part of a planned multi-album deal with Legacy Recordings (a division of Sony Music Entertainment). White Christmas Blue is the celebratory successor to Lynn’s first Legacy release, Full Circle (her 40th Top 10 country album and her highest-charting album ever on the Billboard 200). At the time of Full Circle‘s release, in March 2016, it had been more than a decade since Loretta Lynn had recorded or released any new studio music. 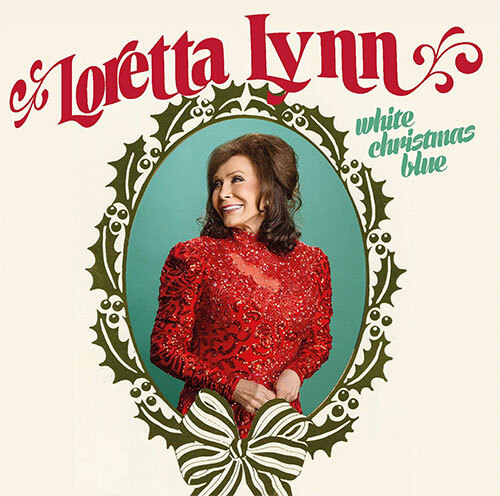 An emotional and personal journey through Christmases past, present and future, White Christmas Blue is an essential addition to any Loretta Lynn library or holiday album collection. Like Full Circle, White Christmas Blue pays homage to Lynn’s deepest musical roots and influences and was recorded at the Cash Cabin Studio in Hendersonville, Tennessee, produced by Patsy Lynn Russell and John Carter Cash.